The 12th episode starts with Sung-Yeol running out of Woo-Hyun’s house because he has realized that his step-mom is also Woo-Hyun’s mom. Sung-Yeol screams why did it have to be her. Woo-Hyun at home phones Seul-Bi and sings her a good night song. At school Jae-Suk’s gang and Suk-Hoon are caught by the gym teacher and are being punished and one guy tells them that Jae-Suk when he was younger used to be beat up all the time but Sung-Yeol saved him and also helped him work out at the gym. Suk-Hoon then goes and tells Woo-Hyun about this and they wonder where Sung-Yeol is because he is not at school. Woo-Hyun tries phoning Sung-Yeol and they see Mrs. Ahn and she tells them that he left early this morning. Mrs. Ahn talks to Seul-Bi alone and she tells her to just stay with Woo-Hyun and to leave Sung-Yeol alone so that he can get over her quicker and that he has asked to transfer schools. After school Chun-Shik meets the other kid getting picked on at a internet cafe and he wants to help him if he meets Jae-Suk’s gang. They see Sung-Yeol sitting a few seats down. Jae-Suk’s gang talk about how Jae-Suk is not really the alpha because Sung-Yeol is because he helped Jae-Suk. Jae-Suk overhears them and tells them to go bring Sung-Yeol to him. They meet Chun-Shik leaving and ask where Sung-Yeol is and the friend shows them he is in the cafe. Sung-Yeol is leaving the cafe and he meets the gang. Woo-Hyun had gotten a call from Chun-Shik telling him that Sung-Yeol is at the internet cafe and he calls Mrs. Ahn. Woo-Hyun tells Seul-Bi to do all the chores at the restaurant and to not come and that he is going to find Sung-Yeol and he meets Mrs. Ahn at the cafe. They walk together and he tells her that he thinks Sung-Yeol is afraid of liking his stepmother because he might lose his real mother and then heads off to keep looking for Sung-Yeol. Sung-Yeol is getting beat up by the gang and Jae-Suk and he tells them that they know now who is the strongest and that he wants to kill him. Seul-Bi was looking and she comes upon them and runs to stop them from hitting Sung-Yeol. Jae-Suk winds up to hit her and one guy grabs his hand saying that they do not hit girls or kids and they acknowledge that he is the strongest. The other guys leave and Sung-Yeol punches Jae-Suk and Seul-Bi holds onto him and Jae-Suk takes a picture of it and sends it to Woo-Hyun. Seul-Bi and Sung-Yeol are sitting in the park and she is tending to his wounds and they are talking about how he doesn’t have anybody. Woo-Hyun has come up behind them and Seul-Bi talks about how she can’t be with him because she only thinks about Woo-Hyun. Sung-Yeol goes in for a hug and she pushes him off. Woo-Hyun comes and takes her away. Later Woo-Hyun finds Jae-Suk and punches him a couple of times. At school Jae-Suk sent the picture to everybody and Ye-Na wrote a bunch of stuff on the blackboard and Young-Eun comes in and starts erasing and Sung-Yeol comes in and it looks like she wrote it. Young-Eun goes and hits Ye-Na with the erasers and Sung-Yeol tells her to stop it and she says how low can she go and says she will show him. Suk-Hoon finds Young-Eun crying in a room and he shuts the door for her. Jae-Suk’s gang member gives the cafe girl her ripped book and a new book. 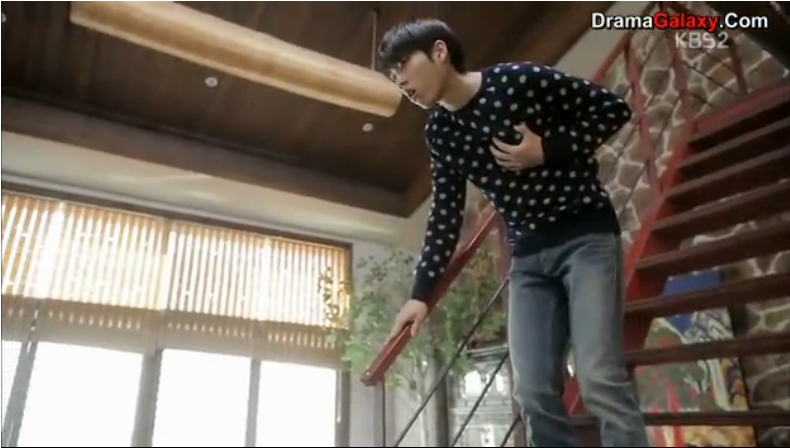 The gang member goes to push Seul-Bi but Woo-Hyun sees and warns her and the guy falls down the stairs. The gym teacher catches him and Sung-Yeol and Jae-Suk because of their faces and they have to clean the gym. Sung-Yeol and Woo-Hyun fight because of the love triangle. Seul-Bi gets cornered by the girls at school but the cafe girl pulls her away and gives her another angel book. Seul-Bi is reading the book and Jae-Suk comes up and asks if she is an angel because of the book title and her wrist starts glowing and she hits his head with the book and runs away. Sung-Yeol texts Seul-Bi to meet him and she doesn’t go until late she goes with Woo-Hyun and he is sick so they take him home and take care of him. Sung-Yeol wakes up and Woo-Hyun is sleeping and meets Seul-Bi she asks what he wanted to tell her and he asks if she even wants to know and then her arm starts glowing and she pushes him away when he sees it glowing. Jae-Suk is with the gang and he wants to do a background check on Seul-Bi. Sung-Yeol orders from the restaurant and Woo-Hyun comes and he asks them to come for dinner and he accepts. Woo-Hun and Seul-Bi come for dinner and Sung-Yeol asks his dad if he can find Woo-Hyun’s mother. Woo-Hyun says that he is scared to look for her because she may reject him again. At home later Mrs. Ahn is looking for the necklace and Sung-Yeol says he cleaned up everything and took out the trash. Mrs. Ahn goes looking through the trash outside and Sung-Yeol comes out and shows her the necklace and asks if this is what she was looking for. He asks when her son came back from America which is Woo-Hyun. Sung-Yeol is upset that she is lying and she says she is doing it for him to stay next to him and that it is better that Woo-Hyun thinks she is not there. He tells her to get out of his family because he doesn’t need her either. Sung-Yeol is playing basketball and Jae-Suk takes his phone. Seul-Bi gets a text and Sung-Yeol gets his phone and looks at it and runs into the supply closet and Seul-Bi goes and finds Sung-Yeol and she got a text that he was locked in the closet. Jae-Suk locks them both in and tells him that Seul-Bi has superpowers and can get them out. Seul-Bi tries to get them out and Sung-Yeol is upset that she wants to get out and starts acting cold and tells her that he is going to steal her heart and everything that Woo-Hyun has. Woo-Hyun comes running in just before he opens Sung-Yeol sees Seul-Bi’s wrist glowing. Woo-Hyun punches Sung-Yeol and says that he is leaving him. Mrs. Ahn goes to Grandmother’s memorial tree and Woo-Hyun and Seul-Bi also go to the tree and hear Mrs. Ahn telling grandmother that she has no right to be Woo-Hyun’s mother and this how the 12th episode ends. Well this has to be about the most exciting episode of the entire series so far!! So many things happened in this episode!! It almost crazy! I mean Sung-Yeol found out about Woo-Hyun’s mother and I was just dying for him to tell Woo-Hyun especially when they were talking in the gym! I was not expecting for him to confront Mrs. Ahn first although inviting them for dinner and asking to find Woo-Hyun’s mother was pretty gutsy but it was obviously not giving the kind of impact that he wanted! In the end Woo-Hyun was also been enlightened to who his mother is by accident! I mean I have been waiting so long for it to come to light I wasn’t expecting that they were just going to spill it out all in the same episode. I was expecting it to be dragged out for a couple more episodes but I am happy that they can move onto the next problem. I have to say when the boys wear street clothes compared to their uniform they were looking pretty good! Especially Jae-Suk!! I find the crush of the tall gang member on the cafe girl is sooo cute that he even fixed her book for her! But I have to say Jae-Suk locking Seul-Bi and Sung-Yeol in the storage closet was kinda weird like what was he trying to achieve? He didn’t even stay and watch to see if Seul-Bi was going to use her powers!? it just seemed weird ? like just because she was with Sung-Yeol it was going to hurt Woo-Hyun even all three of them have hung out all the time!? I do not fully understand Seul-Bi’s wrist mark because it only glows when a suspicious guy comes close so does that exclude Woo-Hyun then because they have held hands and it doesn’t glow? If I was her I would definitely wear a watch or some dark colored bracelet or something to hide it! I really think she is not doing a great job of keeping it hidden! I have to say that this has been the most exciting episode of this drama so far!! I hope that it continue to stay exciting.